JungleDocs for Office 365 is compatible with Microsoft Flow, further increasing the scope of available document automation. While we are working to make our product integrated into Microsoft Flow by default, you can also do it manually. 1. First, you will need a personal API key. To obtain it, go to SharePoint site contents and open JungleDocs for Office 365 app. 2. Once in the app, go to Settings and click Flow Integration. 3. 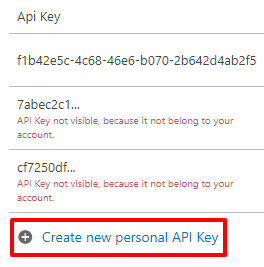 In the window that opens, you can find existing personal API keys and create a new one. 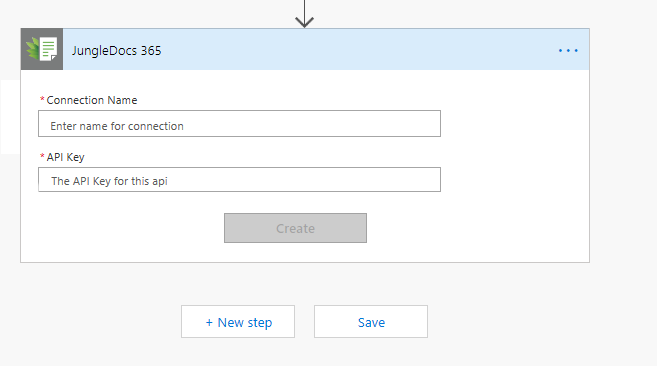 If it's your first time connecting the app with Microsoft Flow or you're a new user, click Create new personal API key and copy the new key for later use. 4. 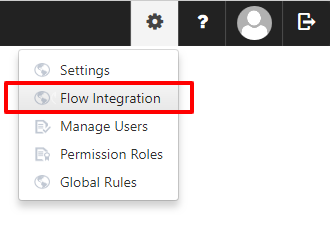 Sign in the Microsoft Flow page, go to My flows and click New. You can create a new flow from scratch or select a flow template. Read more about flow creation here. 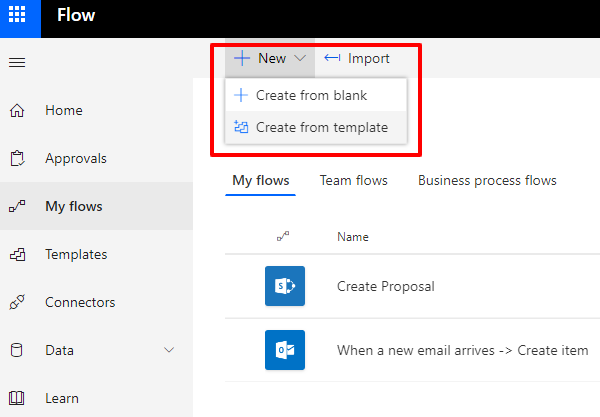 5. if you want to include JungleDocs for Office 365 in your flow, start by adding a new flow step. 6. To locate the app faster, type in "JungleDocs" in the search field. Along with the app, you will see the available action list. 7. 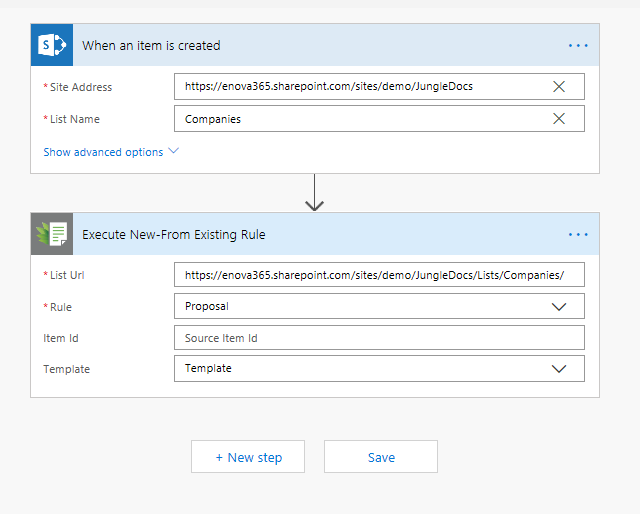 Select an action, for example, Execute New-From Existing Rule (it will create new document from the item which was created in the list). Then, enter a connection name, for example, “JD365-Janis-CreateDocument” or something similar that you can understand in the future. On this step, you will also need to paste your personal API key. This procedure is only required once. 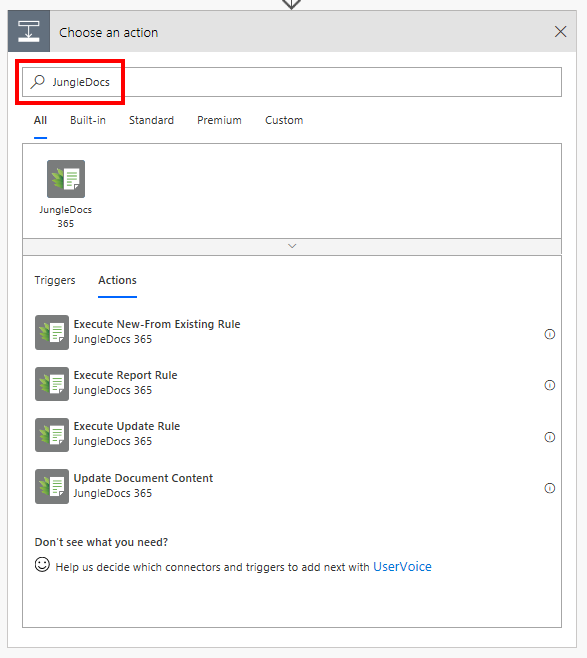 8. in the Site Address field, paste the URL of the source list (in the example it is Companies) and select the JungleDocs rule to execute (the rule should be already configured in the source list). API keys are personal. Users and administrators can see only their own API keys. If the key doesn’t belong to your account, it will be shown stripped. API key scope is global (i.e., for all site collections). It is possible to define who can view, create and manage API keys in permission roles. Only administrators can delete/disable API keys created by other users. Users with permission to manage API keys can only disable or delete their own keys. API owner should have a JungleDocs for Office 365 license, too. Otherwise Microsoft Flow actions connected to the key will not work. By default, flow action execution time is limited to 10 minutes. If the limit is exceeded, flow execution will be aborted. Contact us if you need to adjust this setting. By default, there can be no more than 10 rules running at the same time per user. Contact us if you need to adjust this setting. Flow actions may stop working or display unexpected errors from time to time. This is due to internal Microsoft Flow action provisioning. In this happens, wait for 5 minutes or up to one hour, and the actions should resume working normally.